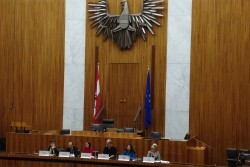 The conference with the title "Enhancing Women’s Share in Peace and Security – Good practice, gaps and challenges in the implementation of the women, peace and security agenda – emerging trends and priorities in 21st century security" took place at the Austrian Parliament under the patronage of Doris Bures, President of the Austrian National Council. In October 2000 a landmark document was adopted by the UN Security Council: UNSCR 1325 on women and peace and security. It highlighted the disproportionate impact of armed conflict on women, recognized their important role in the prevention and resolution of conflicts, and stressed the importance of women’s full involvement in all efforts for the maintenance and promotion of peace and security. With a view to a high-level review in 2015 to assess progress at the global, regional and national levels, and as a contribution to the Beijing+20 Campaign of UN Women, the participating politicians and prominent activists have discussed significant achievements and major obstacles in the implementation of UNSCR 1325 and gave their recommendations on how to achieve improved results in areas such as conflict prevention, management and resolution and participation of women in political processes. Opening remarks were addressed by Secretary General Dr. Harald Dossi and armed forces Brig. Gen. Dr. Johann Frank, Security Policy Division Director for the Austrian Federal Ministry of Defense. The panel was chaired by Alexandra Föderl-Schmid, Editor-in-Chief of the daily newspaper "Der Standard". Ambassador Anwarul K. Chowdhury, Former United Nations Under-Secretary-General and High Representative, Initiator of UNSCR 1325, spoke about the history of the resolution. Ambassador Ursula Plassnik, Austrian Ambassador to France and Former Minister for Foreign Affairs of Austria remarked that "Women in politics is a EU foreign policy issue". She addressed the auditorium with the appeal that "The international community can do much more than to speak in words". Ms Lakshmi Puri, United Nations Assistant Secretary-General and Deputy Executive Director of UN Women stressed that "This is a historic moment!". Ms May Chidiac, President of May Chidiac Foundation and Media Institute described scenes of terrible treatment of women in IS camps. Finally, Ms Hanan Ashrawi, PLO Executive Committee Member, PLC Member, Chairperson of the Board of Directors, MIFTAH, and the Palestinian Initiative for the Promotion of Global Dialogue and Democracy concluded that such a situation of captivity and enslavement can not be tolerated and that women need to take action.